Fans of Archeophone’s celebrated Phonographic Yearbook series, take note. 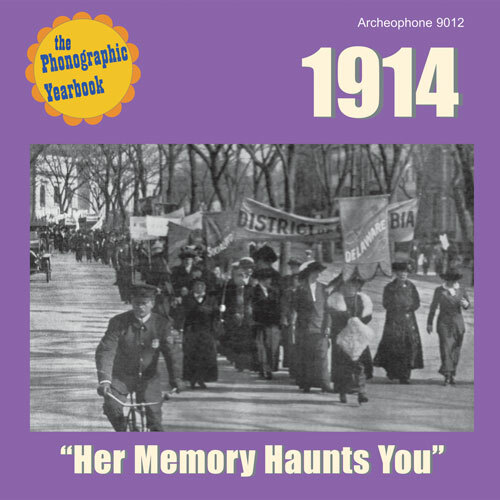 The summer 2011 release of 1914: “Her Memory Haunts You” fills in a gap in the sequence that now results in a solid stretch of releases covering 1912 through 1916 (1912, 1913, 1914, 1915, 1916). 1914 was the year that the hopes and dreams of the progressive coalition that had put their faith in the presidency of Woodrow Wilson saw their agenda put on hold while economic issues–and then the beginning of World War I–took center stage. The soundtrack to the year brings us a good mix of future classics and songs of the moment, odes to country life, and more than a handful of songs longing for home and hearth, both pathetic and humorous. As with Archeophone’s other Phonographic Yearbooks, 1914 comes with a handsomely illustrated, full-color 24-page booklet to accompany the brilliant sound of the 25 tracks. The CD starts with a future barbershop classic, “When You Wore a Tulip and I Wore a Big Red Rose,” composed by Percy Wenrich and Jack Mahoney and sung by the Billy Murray-led American Quartet. It’s a song looking fondly on days of yore, just one of several songs in the survey urging us to “go back.” Check out “California and You,” by Irving Kaufman (one of his first recordings), “Rebecca of Sunny-brook Farm,” Henry Burr’s “When You’re a Long, Long Way from Home,” and “I Want to Go Back to Michigan (Down on the Farm)” by Elida Morris for similar themes. In the case of “The Good Ship Mary Ann,” Nora Bayes’ character waits longingly for her “Paddy dear” to arrive at port from across the Atlantic. What’s extraordinary about these pieces is their variety of musical styles. In contrast to the “home” songs, we have a smattering of selections expressing eagerness to get off the farm and into the city or some other faraway place. The central character of Collins and Harlan’s “I Love the Ladies” is a cosmopolitan who wants to experience everything the world has to offer. The destination is the mysterious east on “I’m on My Way to Mandalay,” sung by the original “Three Tenors”: Albert Campbell, Henry Burr and Will Oakland. But it’s to the beach for summertime fun on “By the Beautiful Sea,” sung in two versions by the Heidelberg Quintet and Ada Jones and Billy Watkins. On “Can’t You Hear Me Calling, Caroline?” stage star George MacFarlane (veteran of Gilbert and Sullivan shows) proves that a full-bodied baritone voice can carry a ballad, as opposed to the tenors who usually got the leads in operettas. One such tenor, the venerable Chauncey Olcott, gives us the lasting ditty, “Too-Ra Loo-Ra Loo-Ral (That’s an Irish Lullaby),” while Ireland’s favorite son, John McCormack, supplies the aching “A Little Love, a Little Kiss,” based on a French song. And a very curious number by Henry Burr, “The Song that Stole My Heart Away,” waxes on about how the old chestnut, “Ben Bolt,” caused the speaker to fall in love. The infectious dance rhythms of Chris Smith’s “Ballin’ the Jack,” performed by Prince’s Band, and W.C. Handy’s “The Memphis Blues,” by the Victor Military Band, show a move toward a different, more exciting kind of musical language than the polite dance music of the past. Other pieces reflect a world shifting with technology. Billy Murray’s “He’d Have to Get Under-Get Out and Get Under (to Fix Up His Automobile)” is the quintessential early expression of man vs. machine–though Joe Hayman’s “Cohen on the Telephone” gives it a run for its money. World War I began in the summer of 1914, but Irving Berlin didn’t know what lay ahead for the world when he penned “The International Rag,” which takes a humorous tone toward the subject of America’s cultural infiltration of Europe. Likewise, “Little Grey Home in the West,” sung here by Alma Gluck, and “It’s a Long, Long Way to Tipperary,” rendered by the American Quartet, were not written as war songs, although they quickly became adopted by British troops marching off to the front. The famous Christmas truce between British and German soldiers occurred in December 1914, but it wouldn’t be long before everyone realized that the war would not come to a speedy conclusion.